Autism Berkshire’s All About Autism conference at The Curve library and cultural hub in Slough on World Autism Awareness Day 2019 – Tuesday, April 2 – attracted more than 120 parents, carers, professionals and students. They were able to enjoy a series of informative presentations from autism advocates, academics and NHS professionals on a wide range of autism-related topics, as well as meet a number of autism and disability support organisations working in Slough and East Berkshire. Videos of a number of the presentations will soon be available online so that people who were not able to make it to the event will be able to benefit as well. The opening speaker was clinical psychologist Dr Fiona Knott, the director of the Centre for Autism at the University of Reading, who looked at Autism and Anxiety. 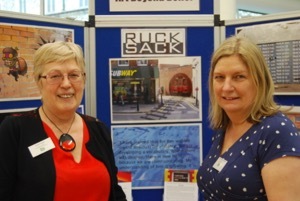 She drew on her extensive experience of working with autistic children and young people affected by anxiety. For many of them, anxiety can have a more serious impact on their lives than their autism. Dr Knott looked at a range of techniques parents and carers can use to help children. 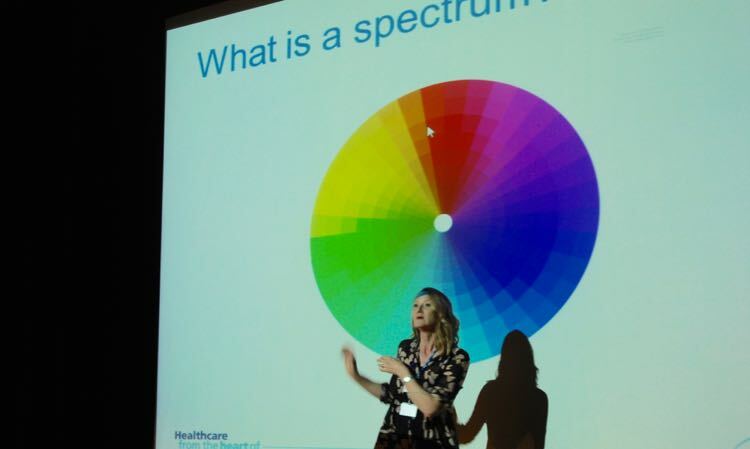 Mairi Evans, pictured above, the neurodevelopmental lead for autism and ADHD at Berkshire Healthcare NHS Foundation Trust’s CAMHS service, talked about Autism, Girls and Oughtism, looking at some of the issues around autism diagnosis, autism in girls and specific factors that can affect diagnosis rates due to the ways autism presents in girls. She also took on the issue of ‘oughtism’ – the way many people are all too quick to offer their views on how parents ‘ought’ to be bringing up their autistic children and dealing with their behaviour – instead, she said, people should be being helped to have the lives they ought to have. Autism advocate Conor Eldred-Earl spoke movingly about his life, progressing from being diagnosed as autistic at an early age, struggling with loneliness and depression in secondary school, despite the steadfast support of a SENCO (special educational needs co-ordinator) to forging a firm friendship in sixth form which had changed his outlook and helped instil the confidence in him to help other young autistic people. 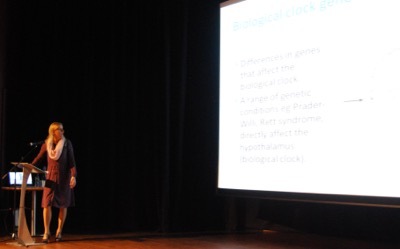 Helen Cattermole, a sleep practitioner with the Berkshire charity Parenting Special Children, concluded the morning session of the conference with a presentation about the challenges of helping autistic children – and other family members – get a good night’s sleep. She discussed the impact that lack of sleep can have on physical and mental health, the factors that can lead to sleep problems and techniques that parents and carers can use to help children and establish good bedtime routines. Click here for details of the Parenting Special Children sleep service and courses that are available for parents, carers and professionals who support families. After a break for lunch, when conference delegates were also able to talk to representatives of a range of support services for people with autism and additional needs in Slough and East Berkshire who had stands in the foyer at The Curve, the afternoon session began with autism advocate and trainer Carly Jones talking about Autistic Women and Girls. She drew on her own experiences as an autistic mother of two autistic daughters – only being diagnosed herself at the age of 32 after both her younger daughters had been diagnosed – the difficulties of diagnosis for girls and women when diagnostic tools were developed for boys and entrenched attitudes that autism did not occur in girls and women. The audience also got an insight into the do’s and don’ts of etiquette at Buckingham Palace when receiving honours – Carly was made an MBE last year for her work to help autistic people. The final presentation was made by Dr Fang Liu, of the Centre for Autism at the University of Reading, who outlined a pioneering research study that she will be leading to help improve the communication skills of the 30% of autistic children who are non-verbal or minimally verbal. The project, which is funded by the European Research Council, will look at the potential to develop music and song-based therapies to help to develop language skills in children aged two to four, drawing on findings from studies of brain activity in autistic and neurotypical children that showed strong responses to music in autistic children, compared with speech. Dr Liu is keen to involve families in the project, to help share their experiences, shape the study and take part in research. Click here for information about the CAASD Lab at the Centre of Autism and the research being carried out there and details of how to contact the team if you are interested in being involved in the new study. Click here for details of all the current research work at the Centre for Autism. The conference concluded with a short presentation about autism support services available in East Berkshire and a quickfire question and answer session. Autism Berkshire’s chief executive officer, Jane Stanford-Beale, said: “It was wonderful to see so many people at the conference and to hear how much they enjoyed what our fantastic speakers had to say. “Our thanks go to the East Berkshire NHS Clinical Commissioning Group for supporting the event and to the team at The Curve and Slough Borough Council for helping to make it such a success. 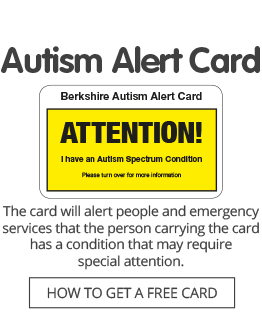 Click here for details of forthcoming free workshops for parents and carers that Autism Berkshire is running in East Berkshire, thanks to funding from the CCG.